Paddy Power have installed AP McCoy as 1-3 favourite to ride Denman in the Cheltenham Gold Cup. Any pre King George speculation as to who Ruby Walsh would choose between the two Gold Cup winners was put to bed in spectacular fashion by Kauto Star. Ruby is 4-1 to ride Denman, which could surely only happen if Kauto doesn’t turn up. Sam Thomas, who was victorious on Paul Nicholls’ What A Friend in the Lexus Chase on Tuesday, is 5-1 while Christian Williams is a rank outsider at 20-1. 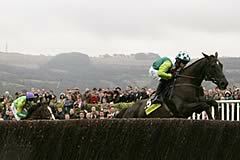 Paddy Power also offer 6-4 for the unthinkable – that neither Kauto Star nor Denman win the Gold Cup. 1-3 AP McCoy, 4 R. Walsh, 5 S. Thomas, 20 C. Williams. Others on request.